Jason Harrison, Managing Director of Northern Bear Safety, really does like to go the extra mile, and more. 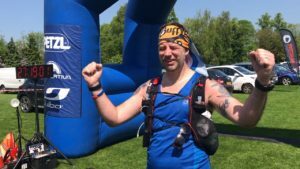 Jason completed an epic 100 mile non-stop run from Richmond in South West London to the centre of Oxford during very hot weather. The course followed the meandering route of the Thames against its flow, showing off the best of English riverside scenery and life on the Thames.